12 July 2016. Ingredients in pomegranate fruit, once metabolized in the gut, are found in tests with lab mice to protect cells against aging. A team from École Polytechnique Fédérale de Lausanne, or EPFL, in Switzerland and the spin-off enterprise Amazentis SA published its findings yesterday in the journal Nature Medicine (paid subscription required). Pomegranates are native to South Asia and grown throughout the Middle East, as well as warmer regions in the Americas. Various health benefits are attributed to pomegranates, but up to now, little hard evidence of these benefits were found. 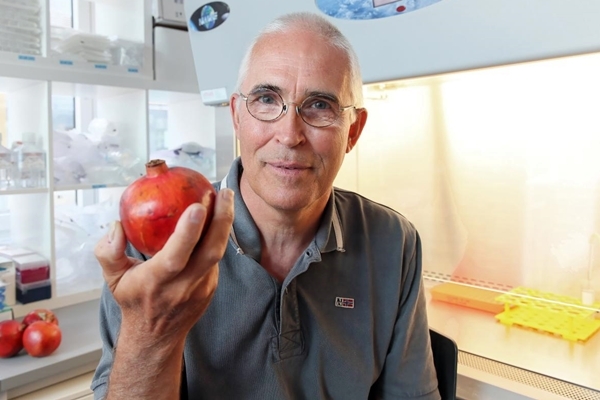 The EPFL-Amazentis team investigated the benefits of a molecule derived from pomegranates known as urolithin A to strengthen the energy function in cells. Urolithin A does not come directly from pomegranates, but is a product of metabolism by microbes in the gut of ellagitannins, bioactive nutrients in pomegranates, as well as some other fruit and nuts including black and red raspberries, strawberries, walnuts, and almonds. Once produced in the gut, urolithin A is processed in the liver. The researchers, led by EPFL physiologist Johan Auwerx and Chris Rinsch, CEO of Amazentis, tested urolithin A’s effects on mitophagy, a process of degrading and recycling mitochondria, the energy centers of cells. As organisms age, damaged mitochondria accumulate in cells, which over time contributes to sarcopenia, a weakening of muscle mass, characteristic of the aging process. Amazentis cites data indicating 30 percent of people age 60 and over and half of those 80 and over experience sarcopenia. Urolithin A is believed to restore mitophagy, thus helping cells recycle damaged mitochondria. The team tested first with C. elegans, a well-studied model species of roundworms with a short life span. The results show exposure to urolithin A increased the life span of C. elegans by 45 percent, compared to similar worms not exposed. During their longer life span, the C. elegans exposed to urolithin A maintained normal mobility and respiratory functions. In tests with two sets of lab mice, one older and one younger group, the researchers found similar results. The mice exposed to urolithin A showed more recycling of damaged mitochondria than comparison groups not exposed. In addition, among older mice, the exposed group showed 42 percent more exercise endurance than the comparison group. Amazentis is developing a product with urolithin A to improve cell health among older individuals. The company started its first clinical trials of its urolithin A product, with results expected in 2017. Auwerx tells more about the research in the following video.